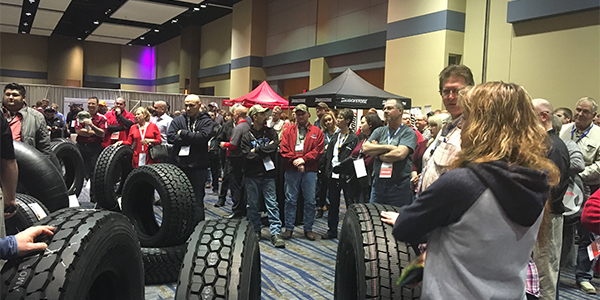 Hundreds of tire dealers within the Mr. Tire/Big 3 Tire network gathered in Overland Park, Kan., on Jan. 19-20 for the 2017 K&M Tire Trade Show and Dealer Conference. Themed “Ignite Your Passion,” the event featured a full line-up of speakers and seminars covering a wide array of high-value topics, including TPMS, agricultural tire pressure, legal concerns with shop training, as well as marketing and customer experience insights. During the trade show, dealers could also speak one-on-one to learn more about products and take part in multiple show-only order discounts. The speakers opened with Tire Review Editor Patti Renner presenting the Mr. Tire/Big 3 Tire Top Shop Award, assisted by award sponsors Jim Robinson of Hankook Tire America and Gene List of O’Reilly’s Auto Parts. Finalists recognized were: Pete Shrake of Budget Tire in Lincoln Park, Mich.; Steve Kirtlan of Kirtlan Automotive in Wabash, Ind., and Dirk Visser Jr. of Trail Tire in Dundee, Ohio. Each finalist will receive a check for $500 and a trophy recognizing their accomplishment. Winning the 2017 Mr. Tire/Big 3 Tire Top Shop Award was Northtown Auto Service and Tire Center in McHenry, Ill. Owners Kristin and Mark Hartmann accepted the award. “We could not be a Top Shop without our team of dedicated employees,” said Mark in his brief remarks as he accepted the award. Following the award presentation, Renner detailed the recommended qualities to transform your business into a top shop. • Chris Neidert, operations manager and ag tire manager for Trelleborg who provided training on tractor tire pressure and its importance to farmers, including how to do the math to determine the appropriate pressure per application for ag tire customers. He also explained how tire dealers can increase their value by providing technical tire pressure details that will help reduce soil compaction and decrease slippage, which results in lower fuel usage, faster plow times and lower operating costs. • Jon Petz, a magician and motivational speaker sponsored by Bridgestone Americas, gave the Friday opening keynote. During his session he talked about the value of delivering your service with passion – that simply meeting expectations in today’s business environment is like doing nothing at all. He recommended a shift away from “transactional relationships” to instead strive for “transformational relationships.” He also provided vivid examples of unlearning and relearning, on taking action and being bold enough to create a unique experience based on intensity and passion. 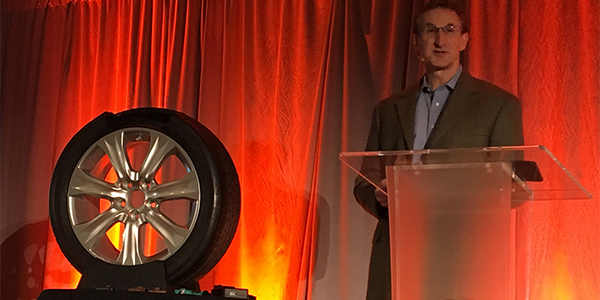 • Kevin Rohlwing, senior vice president of training with the Tire Industry Association, detailed the legal expectations of training and the value of formal training programs and certifications. He noted that on-the-job training does not hold up in a court of law or with OSHA if there is an accident that leads to injury or death at your business. He also explained the importance of having clearly defined roles within an organization, to recognize individuals for their outstanding efforts (perhaps a pocket full of gift cards to reward on the spot) and other ways to encourage staff to exceed expectations more often. • John Rice of 31 Inc. provided a TPMS primer, overview and update on sensors and the legal requirements behind service. With more than 150 million vehicles using TPMS currently on the road since they were initially mandated in 2007, Rice said that the failing batteries can be a profit center for your business. He also detailed replacement options, OE products, relearn procedure resources and more. • Jack West of Federated Insurance provided options to help make sure the most valued employees have incentives to stay with you. Suggestions included the obvious – competitive wages, performance reviews and benefits – with some innovative ideas on three-year or five-year bonus schedules, providing non-monetary bonuses based on personal interests (such as a new fishing boat or snowmobile every three years instead of a cash award), and insurance to cover the business expense of key people who leave or pass away. John Rice of 31 Inc.
Wrapping up the presentations was Kevin Knebel of K&M Tire who detailed ways in which the company focuses on “partnering for success” for its Mr. Tire and Big 3 Tire dealers. He said more than 1,000 dealers are now part of the network. New this year is a Chevron oil and lubricant program that includes bulk pricing, volume discounts and in-store product opportunities. He also shared updates on: consumer financing available through Synchrony Financial and how that matches up against other leading credit card options; consumer rebate programs; an exclusive program with Kumho that includes quarterly cash rewards; parts programs and rebates; new exclusive pricing on a new shop management program with Alldata; details behind an available national tire protection warrantee program; Mr. Tire/Big 3 store signage options; and marketing support solutions available from the K&M design team. • Plus six 60-second sessions in the Continental Cash Grab Booth filled with $100 bills for the grabbing by lucky participants.